There are roughly 30 acres of leeks grown in New York annually. They are an edible member of the Liliaceae or lily family. They are tender and have a mild onion flavor with a slightly sweet edge. 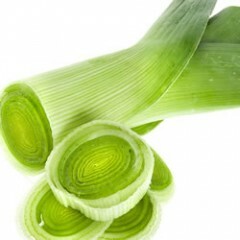 Leeks may be planted in late February to March for harvest in early- to mid-summer. Alternatively, they may be planted in July for harvest in late fall/early winter. Leek is an expensive crop to grow, because it is labor intensive. Hand labor is required for all stages of production including: transplanting, weeding, harvesting, washing and packing. Information on cultural practices and pests of leeks can be found in the Leek Pest Management Strategic Plan.